An idea is a wonderful thing. Whether highlighting a partnership, telling a unique story about your brand or a creative way to explain your new product, the process must always start with an idea. The secret is out that videos are an integral asset to every industry, but many people find themselves struggling with how to take their idea and turn it into a final product they can be proud of. What makes a Video Production Company a Full Service Production Company is the partnership entered into with our clients and the guarantee that we are the only call you will ever need to make on your journey to creating a corporate video for your company. Regardless of how much help you need with creative, the scale of your production or the number of crazy props and sets you have in mind, a Full Service Production Company is your one stop shop for making it all happen. I know I Need a Corporate Video for My Company. But Now What? When you begin your search for a video production team, you’ll see a lot of companies that offer video packages: testimonial video package, 2-camera + audio package, event video package, etc. We don’t believe in confining a corporate video production into a package. Instead, we believe in taking on each corporate video project as its own entity. That means; first, finding out what you need to bring your idea to life; and then, supplying whatever it requires to make beautiful video content within your budget. That’s a full service production company. Each company we work with is totally unique; therefore, they require special video content catered to their needs. The very first thing we do in our initial concept meetings is to learn about your organization and just what it is you do best. We’ve worked with well-established companies and brand new startups, but the one thing they all have in common is a focused mission to get to the heart of what makes their company special. Our job is translating that message into beautiful, captivating, and original video content. Video content sounds vague? Do you just mean a commercial video or a testimonial video? Video content nowadays does seem to come in endless forms. While we’ve produced the more traditional testimonials videos and commercial spots, we’ve also taken on social media videos, event sizzles, company story videos, and some truly one-of-a-kind requests. After learning more about your organization and your specific goals, we’ll advise you on what format of video we believe can best suit your message. With your input and knowledge of your organization, we’ll begin our collaborative process by guiding you though pre-production. As part of a creative partnership, full-service production companies should be there to assist in fleshing out an idea to achieve its purpose. One thing we see happen all the time is a company coming to us for a corporate video and getting much more use than they’d anticipated. For New York Health and Racquet Club, we were brought in to produce a series of testimonials. As the piece came together, we realized that we could repurpose some of the material for a social media campaign and even a 30-second commercial. How long is pre-production going to take? And where does my corporate video go from there? Pre-production can last anytime between a few days and a few months, depending on the size and scale of the project. You don’t need to worry much about that though, as our team of specialists has decades of combined experience overseeing the nuts and bolts of pre-production. With your concept in place, we’ll work with you in planning a script and shot list, while our producers orchestrate the shoot day. 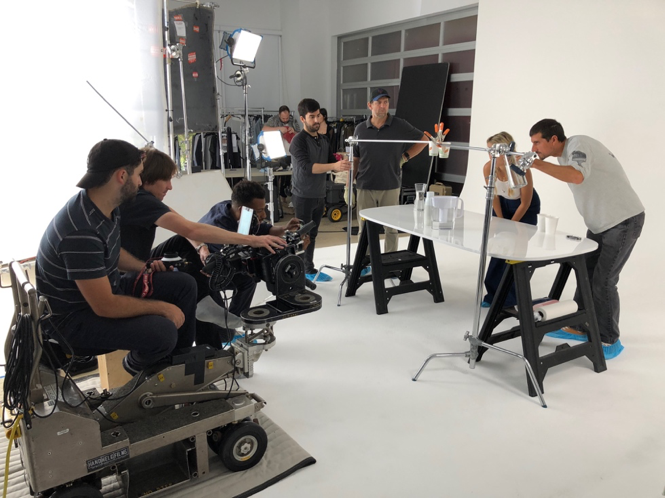 Part of what makes a full service production company is the capability of offering any resource that our client sees fit: whether it’s a custom-built set, camera drones, or a green screen. Not to mention how critical it is having that experienced video production team to help navigate potential roadblocks. So the video shoot day is here. Now what? If you’re working with an experienced and resourceful production team, your shoot day should be a breeze. Just like a great surgeon or chef, a top-tier crew makes the job look easy. An ASL production involves a cast of specialists guiding the client through a stress-free production day. It’s of the utmost importance for us to communicate with our clients throughout the shoot. Every ASL shoot is a collaborative experience. We pride ourselves on our transparency, because at the end the day, that’s what’s critical for a full service production company to help bring your vision to life. On every shoot, we set up our handheld client monitors so that our client can view the shots that we’re capturing in real time, literally putting your project in your hands. When Can I Expect to See That Vision? Good Question. Sometime shortly after wrap, we’ll deliver our post-production schedule. Here, our editors play a crucial role in working with you to find the perfect voiceover, music, and graphics to make your vision truly pop. If all is running as planned, you’ll start receiving edits within weeks of the shoot. Certain events that we cover require especially rapid turnaround. For Nielsen’s C360 conference, our sizzle videos are shot, edited, and treated all in 24-hours time. Ask anyone in corporate video production and they’ll say that post-production is the most underrated aspect of a project. Needless to say, we take it very seriously. Not only does the video come to life in the editing room, but it’s also where the client can give their input to shape the project to their desired needs. Without a comprehensive post-production unit, we wouldn’t call ourselves a full service production company.